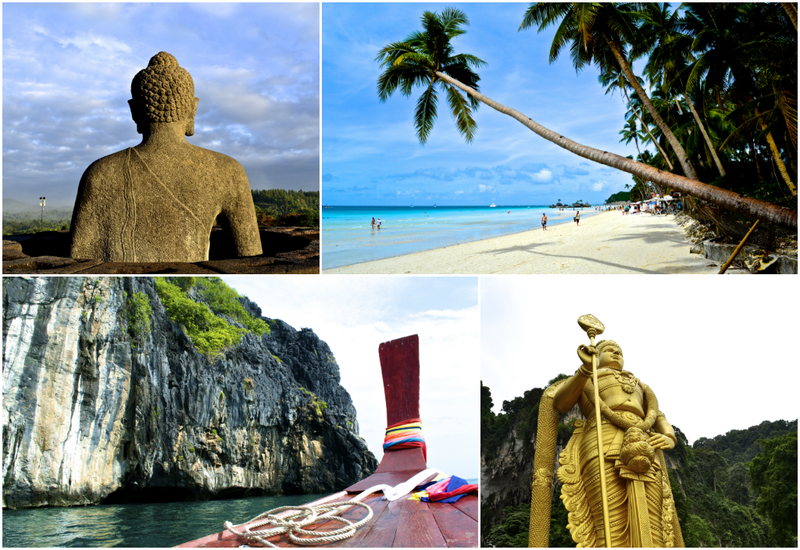 Clockwise from top left: Borobudur, Indonesia, Boracay, Philippines, Koh Lanta, Thailand, and Kuala Lumpur, Malaysia. Southeast Asia is wonderfully large. Comprised of around 20,000 islands scattered throughout the Pacific and Indian oceans, traveling here is an endless adventure. There are so many beautiful and unexpected treasures to get your hands on here and if you plan your trips well, they can be incredibly affordable. Friendly locals, vibrant cultures, tropical weather, affordable luxuries, and amazing food; Southeast Asia is quickly becoming one of my favorite parts of the world. I’ve lived in Indonesia for one year and have had the chance to travel most extensively in this country. With over 17, 000 islands, I’d say one year still isn’t quiet enough! At the end of this month, Laurens and I will be moving onto Malaysia for two years to conquer our next adventure. I can’t wait to keep exploring another interesting country here in the region. Thank you for sharing, could I post it on my Tumblr to share to my families? Sure, please share with whomever you like!! !Thanks for reading, Terry.